This PDF 1.5 document has been generated by LaTeX with 'moderncv' package / pdfTeX-1.40.14, and has been sent on pdf-archive.com on 25/06/2017 at 21:32, from IP address 91.93.x.x. The current document download page has been viewed 378 times. 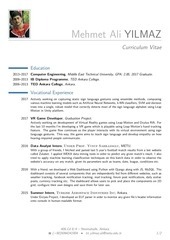 2013–2017 Computer Engineering, Middle East Technical University, GPA: 2.85, 2017 Graduate. 2009–2013 IB Diploma Programme, TED Ankara College. 2006–2013 TED Ankara College, Ankara. 2017 VR Game Developer, Graduation Project. 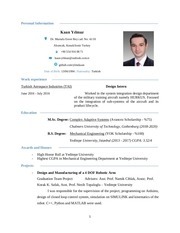 2016 Data Analyst Intern, Under Prof. Yusuf Sahillioglu, METU. website’s accuracy on any match, given its parameters such as teams, date, league, conditions etc. grid, configure their own designs and save them for later use. 2015 Summer Intern, Turkish Aerospace Industries Inc, Ankara. onto console in human-readable format. 2013 Graduation Thesis, International Baccalaureate. This file has been shared by a user of PDF Archive. Document ID: 00616718.